A clean jar. Some experts say you should use a sterilized jar. That’s not a bad idea, but I just use one recently sent through the dishwasher. A wide mouth makes this process a lot easier. Carrots & fresh ginger root. Ground fennel & cinnamon, & salt. Wash all your produce thoroughly. 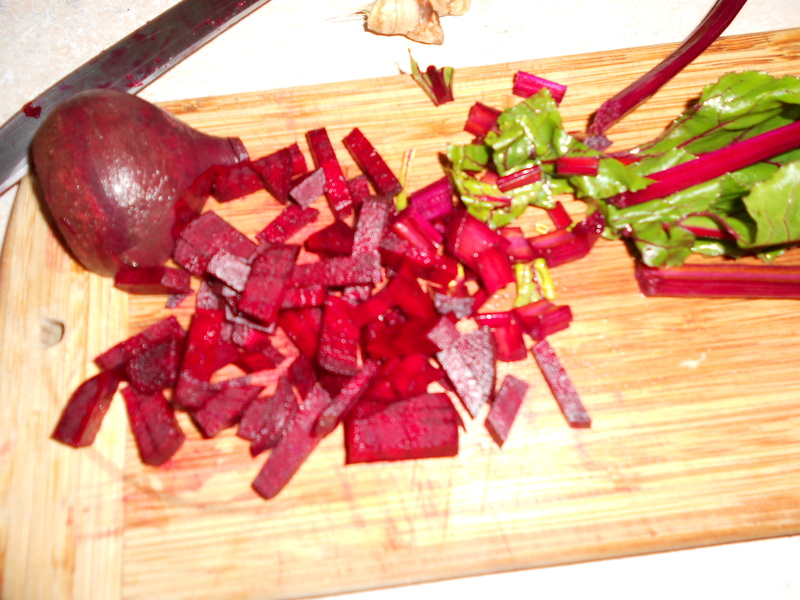 Cut beets, leaves, stems, & carrots into smallish pieces. I use the finished product as sort of a condiment, so I cut accordingly. Mince ginger finely. 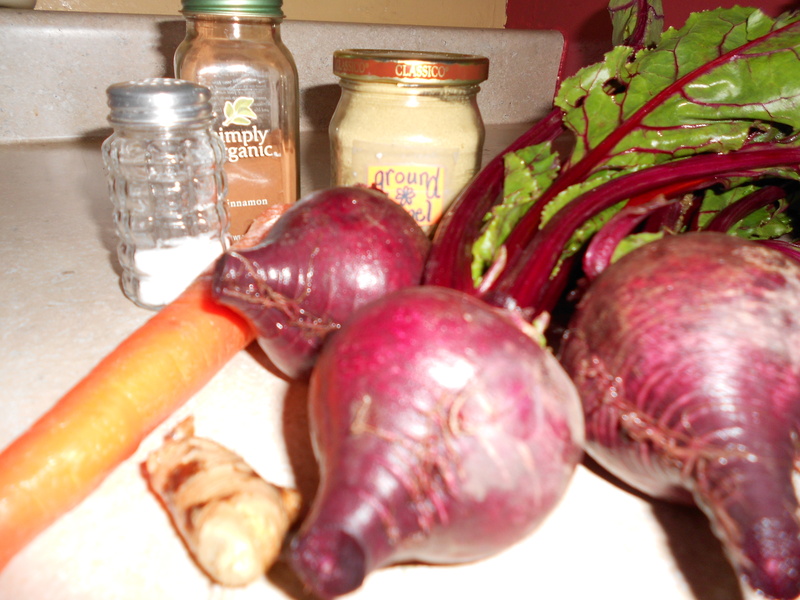 Use the whole beet– it’s all good! Now, begin placing ingredients in the jar. I like to layer everything, sprinkling with salt as I go. I sprinkle ground fennel & cinnamon, sparingly, too, as I go. You can use any size jar you like; but this is when the wide mouth comes into play. As you add to the mix, with a wooden spoon, sort of squish & pound the whole mess, as best you can. The idea is to cram it all in while, at the same time, releasing some juice. When the jar is beginning to become full, I will begin pushing it all down, using clean fingers. 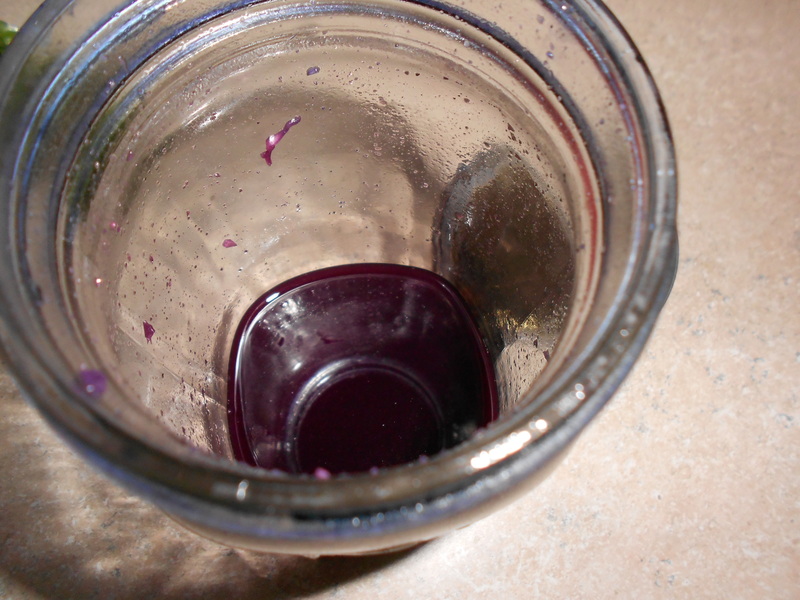 You want to leave some room at the top of your jar, as things will expand a bit as it ferments. I try to leave about an inch. Then, I cover it all with a bit of water. Filtered water is recommended. You don’t want any solid bits above the water, exposed to oxygen, as it will then grow mold. But it’s easy to avoid this happening. Just open up the jar every day or so, and, with clean fingers, push the solids down. So how do we get this concoction to ferment? There are a few options here. First, you can start with some whey. You can get whey at a good dairy, sometimes at a natural foods grocery, or you can strain off your own from some plain yogurt. Put a cup or so plain yogurt in a clean dish cloth or a few layers of cheesecloth, inside a wire mesh strainer, over a bowl or jar. Cover with a small plate & let it sit for a few hours. Your whey will collect in the bottom. You can add a little salt to the yogurt that is left, & spread it on some good toast (we call it “cream cheese”). Add the whey to your ferment. It will be ready in 2-4 days, sitting at room temperature. 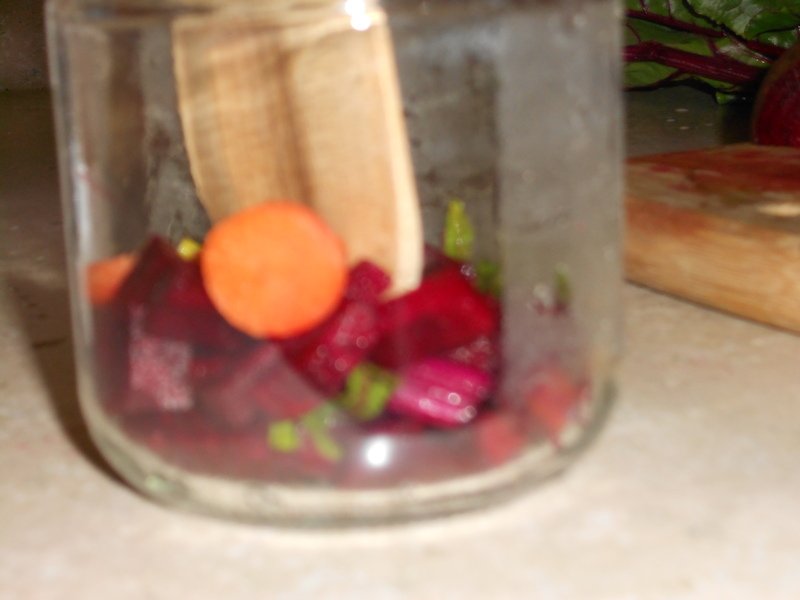 Another way to ferment is to add a little extra salt to your veggies. The microbes will find them–trust me! However, it will take longer to get a nice microbial action going, maybe about 3 weeks. The salt, as I understand it, helps keep the “bad” microbes to a minimum. Again, feel free to open it up to test it. My favorite method is to save back some of the liquid from a previous culture. It doesn’t have to be the same recipe, but I do consider the possible taste outcome. Of course , you’ll have to start somewhere. The finished product–a little spicy, sweet, perfect! 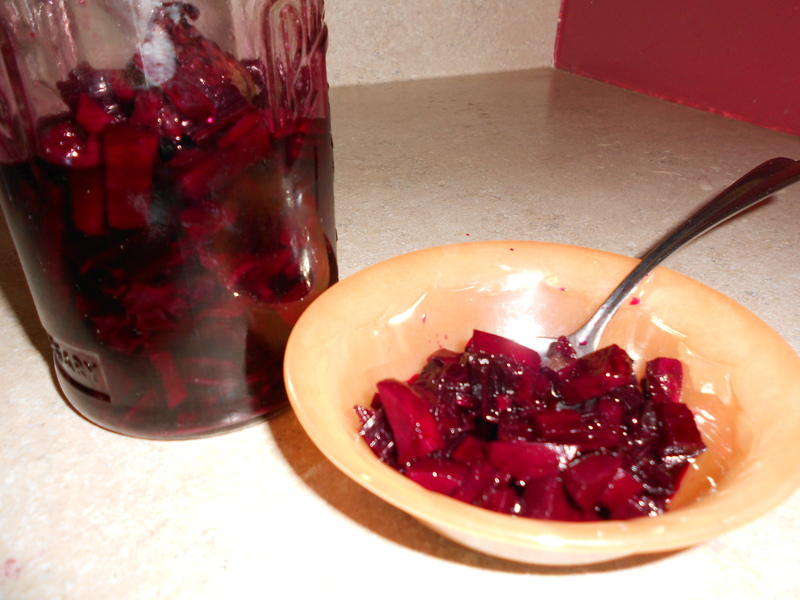 I believe fermented foods are so important to our diets that consuming them in good amounts could transform our health! In a future post, I will be giving you some more specifics about this. In the interim, refer to my last post for other sources to check out. ← What’s “In Season” In The Dead of Winter?